PM Modi Conquers Facebook, Is The Most Talked About Facebook Topic! Around 13 crore Indians are using Facebook, as you are reading these lines. Besides Whatsapp, Facebook is the only social network which has hooked India into it’s charm of ‘likes’ and ‘shares’. To understand Facebook’s ‘Year in Review’ report for India would be very much like understanding what Indians are thinking about right now. And if we go by this metrics, then PM Modi is the clear winner. Based on the conversations between Facebook India users, it has been revealed that PM Modi is the most talked about topic in India. He has beaten other prominent topics like Taj Mahal & Abdul J Kalam. Interestingly, “Ecommerce Boom” is a topic which has caught India’s fancy in 2015, as it is ranked #2 most interesting topic which India discussed on Facebook. Ex-President of India Abdul J Kalam is on #3, whereas the only movie getting featured on this coveted list is ‘Bahubali’ at #4. 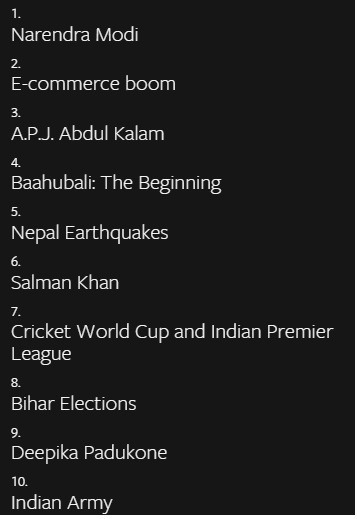 Nepal Earthquake is at #5, while Bollywood superstar Salman Khan finds himself at #6. Bollywood actress Deepika Padukone is the only Indian lady to get featured on this list; while Indian Army is the 10th most talked about topic. Facebook users tend to ‘check in’ into any place they visit. By understanding the most check-ins places on Facebook, we get an idea about the preferences of Indians, and how tourism is developing in the country. India Gate in New Delhi is the #1 place in India, where maximum Facebook users checked into this year. Taj Mahal is at #2, while Marine Drive comes at #3. Nandi Hills in Karnataka is the surprise entry this year at #4 and Gateway of India at Mumbai is at #5. 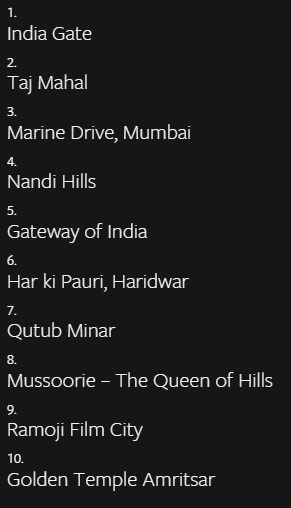 Mussoorrie at Uttranchal is the only hill station from North India to get featured here while Ramoji Film City in Hyderabad is at #9. Qutub Minar is the 2nd location from Delhi to get featured on this list at #7. US Presidential elections of 2016 has already gripped Facebook users, as it is the most talked about story globally. November 13 Paris Attacks stirred the emotions of all users, as it is ranked #2; while Syrian War and Refugee crisis is at #3. Nepal Earthquakes was scary to become 4th most talked about story on Facebook, while Greek Debt Crisis and Marriage Equality Rights are at #5 and #6. At #7 is Fight Against ISIS; #8 is Charlie Hebdo Attacks in Paris; #9 is Baltimore Protests in US and #10 is Charleston shooting incident. Barack Obama is World’s #1 global leader as of now, followed by Donald Trump at #2 and Dilma Rousseff, Brazilian President at #3. PM Modi is ranked #9 in this list, just below #8 ranked Muhammadu Buhari, President of Nigeria and above #10 ranked Benjamin Netanyahu, PM of Israel. Hilary Clinton, one of the strongest candidates for US elections in 2016 is at #4, Bernie Sanders, the longest serving US Congressman is at #5, Luiz Inácio Lula da Silva, ex-President of Brazil is at #6, Recep Tayyip Erdo?an, President of Turkey is at #7. "PM Modi Conquers Facebook, Becomes The Most Talked About Topic In India! (Facebook Year in Review 2015)", 5 out of 5 based on 4 ratings.